The AG's new offspring will have burst onto the world next week. In celebration of this joyous event, I composed a little ditty to the lyrics of a rhyme that Pocket extemporizes near the end of the novel (p. 259 in the advance reader's copy, I think). It is written in the style of a late-medieval dance-song as might have been performed at the time by a troubadour or trouv�re (or troubaritz, if female). You can hear the song by going to this arrangement of the tune at Photobucket in the form of a rudimentary video. So as to avoid spoilage, this is a purely instrumental arrangement -- which means that you can't see or hear the lyrics, other than the first two words as the title. The tune is presented three times -- in a very, very, VERY loose approximation of late-medieval secular musical style. Am I the ONLY person on the board who hasn't read Fool yet? I haven't read it, and the way things are going, lately, I may have to wait a while before I can afford it. There might be a possibility if I get enough of a tax refund. So cheer up! You will most likely read it before I do. Now I feel bitter and guilty. Fif, your song makes me want to dance around a Maypole! I haven't read Fool yet. I've pre-ordered it and will patiently await its arrival. JAG - you do know that Maypole is feef's pet name for his little feef, don't you? And Feef, i'll see if I can work up that graphic of the music this weekend. I did not know that... but I am not surprised. Still, if he ties some ribbons on it, I will dance around. Ginjg, I just sent you another PM. That reminds me: does Shop Fruitbat sell a fool's cap that can fit on my little Feef? I have not read it. I'm getting first day though. 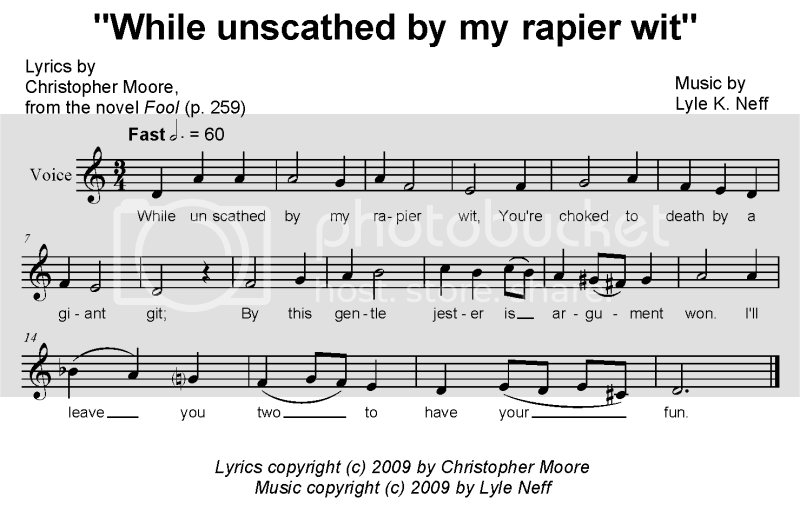 If'n y'all was hankerin' to see some sheet-music for the video-enhanced audio file above, the melody with the AG's poem can be seen at Photobucket -- in modern notation. I say "modern notation," because one of the images used for the Fool merchandise at Shop Fruitbat (which Ginjg mentioned in another thread) is a "fake" medieval manuscript of the song in uncial-style font and old square notation (without rhythm indicated), all done in the spirit of reflecting something of Pocket's skills in both ****SPOILER**** writing and singing.